A lot of you may feel that I am overstepping my boundaries when it comes to sharing my papaya recipes. Some of you may think that papaya is an overrated fruit by now. I don’t blame you for feeling that way. I would scream if I saw another papaya recipe but apparently papaya seems underused to me if I am posting my third recipe. If you haven’t figured it out m now, I am hooked on papaya. Yes I eat other fruit as well. If I am not obsessing too much over papaya, then why am I sharing another papaya smoothie recipe with you? This smoothie recipe has an ingredient that sets it apart from other smoothie recipes. I added some fresh kiwi to the mix. I bought a couple of kiwis without think much about what I would do with them. Kiwis are expensive so I try to be frugal and creative on how I utilize them. I know a good smoothie when I taste one. 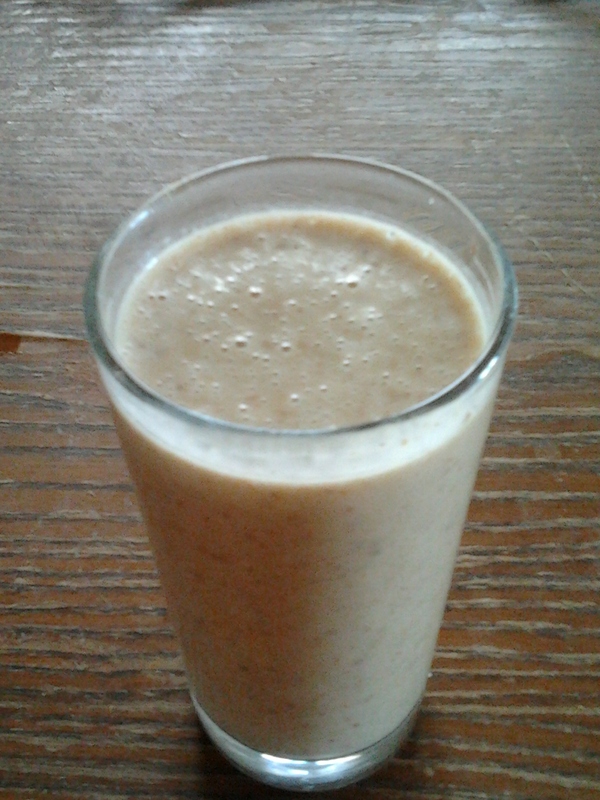 I suppose if I post one more smoothie recipe, I may as well create a separate smoothie blog. Papayas make a wonderful addition. The sourness of kiwis offers a perfect balance. I enjoy the combination of both tropical flavors. 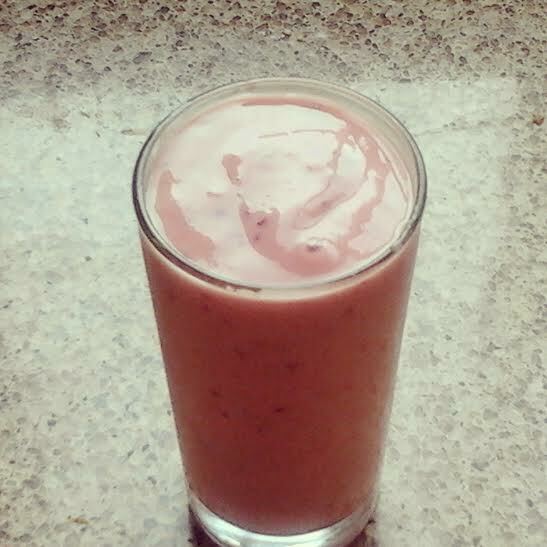 Smoothies are a great way to jumpstart your morning; especially good after a workout or an exercise or a swim. in this smoothie, you will taste a bit of all three fruits. Unless you have a sweet tooth, there is no need to add sugar or any other sweetener while making this smoothie. Aside from using sweetener, you can also include naturally sweet dry fruits, such dates or dry figs in the smoothie instead of sugar or honey. It was already sweet that I didn’t have to add any sugar at all. Place all ingredients in a blender and blend till smooth. Add crushed ice if needed. 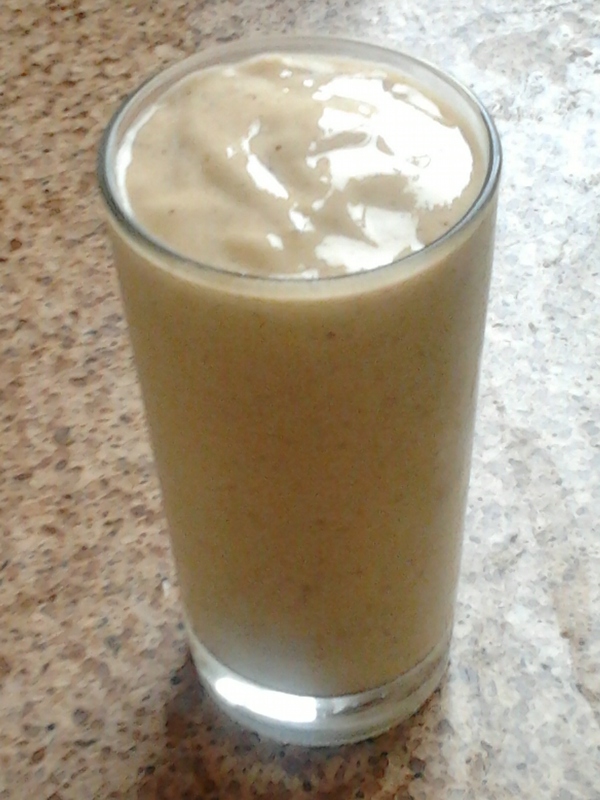 This entry was posted in Breakfast, Drinks, Gluten Free, Sugar-free, Vegetarian and tagged breakfast ideas, papaya kiwi smoothie, papaya recipes, smoothie recipe. To a lot of people I know and even to me at a certain extent, carob has a negative connotation. When I think of carob, I visualize these hard leathery pods that take minutes to bite into. I nearly dislocated my jaw from trying to chew into them. I have no objection to carob powder though. And I have been using carob powder as of late; mostly in my drinks. Carob is a pod like fruit that is native to the Middle East where is has been in cultivation for nearly 4,000 years. Akin to cocoa powder and chocolate, carob powder come from a tropical pod in which the pulp is roasted and ground into powder. Interestingly enough, most carob trees are monoecious. They contain individual male and female flowers. The dark-brown pods are not only edible, but also rich in sucrose and protein. Moreover, the pod has vitamin A, B vitamins, and several important minerals. Some nutritionists recommend using carob powder in lieu of cocoa powder and there is a reason for it. The nutrition facts on one tablespoon of unsweetened carob powder lists 25 calories, no fat, no saturated fat, no cholesterol, and 6 grams carbohydrate. By comparison, one tablespoon of unsweetened cocoa powder contains 12 calories, 1 gram of fat, no saturated fat, no cholesterol, and 3 grams of carbohydrate. Despite the difference in texture and taste, a candy bar made with carob has about the same amount of fat and calories as a chocolate bar. Unlike cocoa powder and chocolate, carob is caffeine-free. Carob also contains three times as much calcium as cocoa powder. That doesn’t go to say that I am substituting cocoa powder for carob powder from hereon out. I am merely trying to accustom my taste buds to the flavor of carob powder. Plus the idea of making carob brownies and cookies is still of an interest to me. As of now, I will be sharing a carob smoothie recipe with you. Place all ingredients in a blender and blend till smooth. Serve cold. This entry was posted in Breakfast, Drinks, Gluten Free, Vegetarian and tagged carob powder, carob smoothie, smoothie recipes. I have been searching papayas for quite some time. I was elated when I found some at my local supermarket. I bought a couple but didn’t think how I would go about using them. Drinks are always an available option. I don’t drink that many fruit juice primarily due to the fact that they are laden with sugar and artificial flavourings. 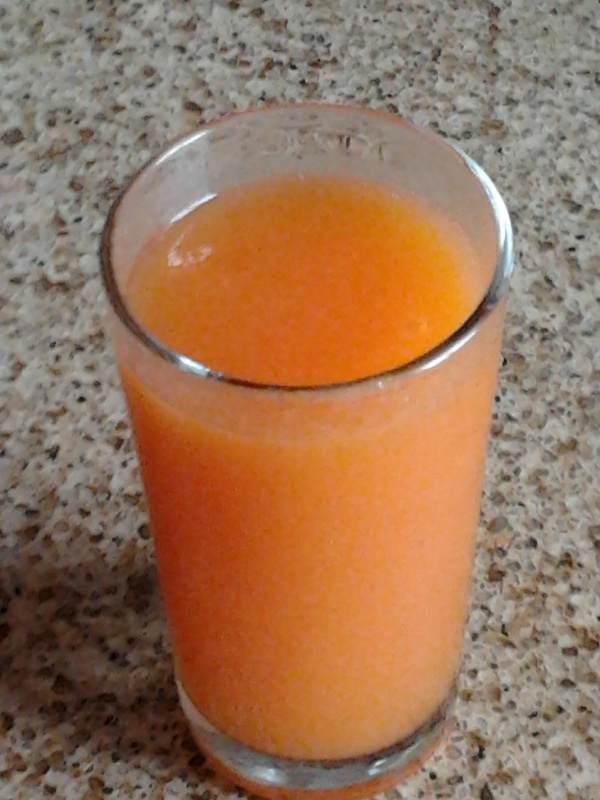 This particular fruit juice, however is sugar-free and natural. Oddly enough, I noticed that my skin was clearing dramatically. I heard that certain natural sugar-free drinks are good for your skin so I wasn’t too surprised when my face was looking more radiant and clean. Place all ingredients in a blender. Fill it with water. Blend till smooth. Strain pulp with a sieve. Transfer to a pitcher and serve chilled. This entry was posted in Drinks, Gluten Free, Sugar-free, Vegetarian and tagged carrots, fruit juice, grapefruit, papaya, sugar-free drink. Normally, drinks or smoothies exclusively made of vegetables doesn’t appeal to me. 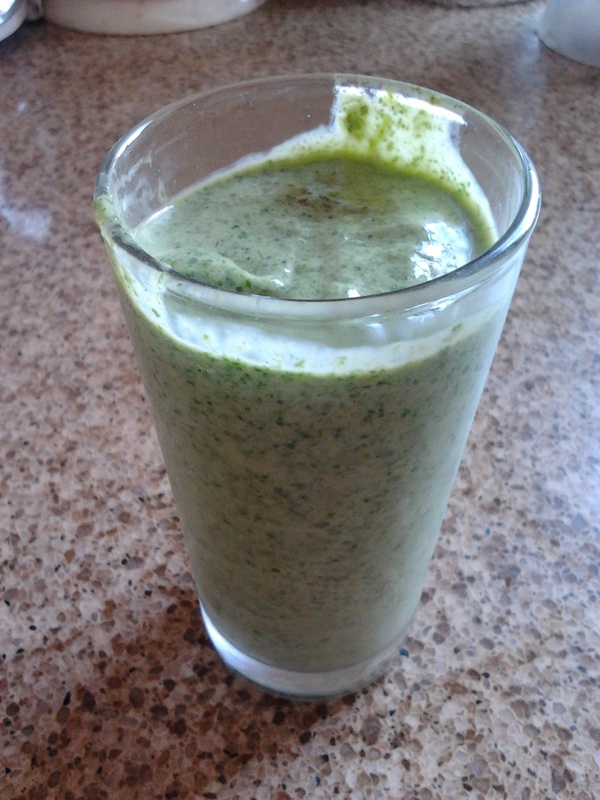 Since green smoothies seem to be the latest rage these days, I had to try it for myself. And I did. I never felt so energised since my slurpee drinking days. The best part it that they are not as addictive as caffeinated drinks are. Apart from that, drinking green smoothies is a great way to incorporate tremendous amounts of greens into your diet – not just eating vegetables alone. One serving of a green smoothie contains over 3 cups of dark leafy green vegetables, which is more than many people get in a week. Dieticians have been educating the public about the multiple benefits of greens for decades, but it was not clear how to incorporate fresh greens into everyone’s daily diet. Greens are believed to have more nutritional value than any other vegetable. Green vegetables even have high-quality, easily-assimilated amino acids– enough to build the protein that supports the muscle mass of gorillas, which pound-for-pound are the strongest animals on earth. Blending greenss help make their full spectrum of nutrition readily available to the body. Nutrients are encased inside plant cells and getting their benefits requires these cells’ walls to be ruptured. Green smoothies are generally made by blending large amounts of raw leafy green vegetables with fruit to soften and sweeten the taste. Vegetables in green smoothies consist of kale, spinach, swiss chard, collard greens, celery, broccoli, and parsley. As one of the healthiest breakfast meals, green smoothies retain all of the fiber of the greens and fruit, rather than removing it. Fiber is critical for ongoing cleansing by sweeping out toxins on a regular basis, helping to keep your digestive tract and body clean, and also keeping you more full so that you tend to eat lighter meals throughout the day. Blend all ingredients in a blender until smooth. Serve chilled or freeze for later use. This entry was posted in Breakfast, Drinks, Sugar-free, Vegetarian and tagged green smoothie, green smoothie diet, greens, healthy breakfast meals, weight loss smoothie. I don’t have smoothies that often. When I do, it’s a treat and a great break from cereal. There are many different ways to make a healthy smoothie. I am sure you’ve encountered a myriad of smoothie recipes. 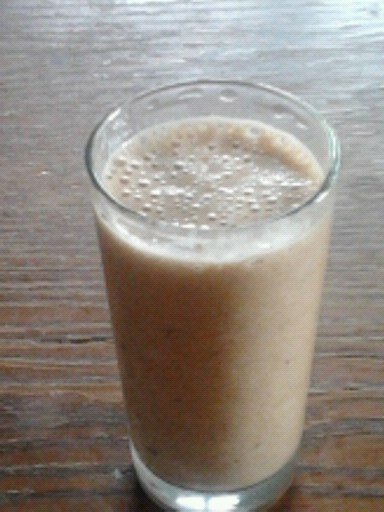 Smoothie drinks can be made from almost any ingredients, but a banana nut oriented smoothie is a favorite among most people – including myself. While bananas add substance to smoothies, nuts are the heroes in this drink. I have been trying to detox as of late and am cautious as to what I decide to put in my mouth. While you can make a healthy and balanced smoothie using fruits and vegetables, I find that adding a little fat can make the smoothie more satisfying. It also can keep you energized until lunchtime. I used a couple tablespoons of almond butter and hazelnut milk (follow instructions from my almond milk recipe). I also added flax seeds as they are a rich source of omega-3 fatty acids which studies have linked to a variety of health benefits. I sometimes like to sweeten my smoothies with a miniscule amount of molasses. You can use any natural sweetener of your choice. After slurping down one cupful of this morning delightful drink, I intended on setting aside the remainder for later. I was too impatient to wait that long so I subsequently guzzled down the rest. Its hopeless for me. In my defense, however, that’s all I had for breakfast. And it kept my cravings at bay for a couple of hours. This entry was posted in Breakfast, Drinks, Gluten Free, Vegetarian and tagged almond butter, hazelnut milk, healthy smoothie, smoothie drinks, smoothie recipes. Until my teens, I never cared for coffee. The aroma and the flavors didn’t seem to translate. I didn’t like the taste lingering in my mouth for hours and have people complain about my malodorous breathe emanating from my mouth. Sadly, I am struggling to kick the addiction. I wish that body is hard-wired enough to have an abundance of natural energy. Alas, it doesn’t seem to have any of its own. But I do remember to carry a pack of mint flavored gum or breath mints. Despite what others may think, I am very self-conscious about my dental hygiene. I don’t like having a smelly mouth. Despite my coffee addition, I try to limit myself to one cup of coffee a day. I am normally not an iced coffee drinker but since the weather hasn’t considerably cooled down, I decided to make one of my own. A heaping teaspoon of vanilla paste or pure vanilla extract accentuates the authentic vanilla flavor in this ice coffee recipe. If you don’t like vanilla, you can use other flavors as well. What I like most about this vanilla iced coffee recipe is that its sugar-free. Dairy-free coffee is normally difficult for me to swallow as milk usually does a better job mitigating the strong coffee flavor rather than soy milk. I decided to try this recipe using almond milk instead. If you are looking to stay awake in the morning amid the last days of the summer brutal heat, I have just the perfect recipe for you. Place all ingredients in a blender and blend till smooth. Serve at once. 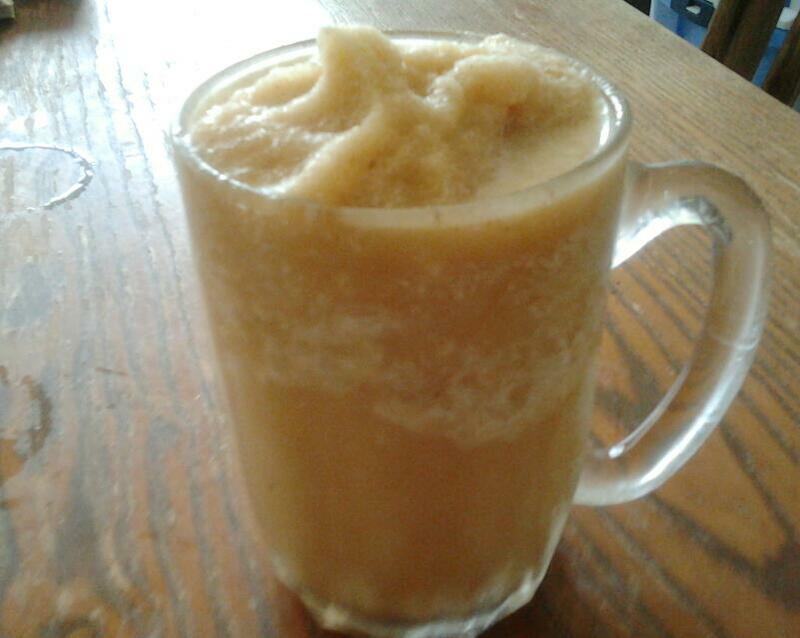 This entry was posted in Drinks, Gluten Free, Vegetarian and tagged coffee addiction, dairy-free coffee, iced coffee recipe, vanilla iced coffee.